I've been debating about when it is acceptable to plant in a straight line. Mostly I've been debating with myself so I thought I'd get another opinion. I could think of no one I'd rather have the opinion of than you, Hortense Hoelove, my favorite garden advice columnist. I'm so glad you asked about planting in straight lines. Let us first address planting in vegetable gardens. I think most gardeners will agree that planting in straight lines, let's call them rows, in a vegetable garden is the correct way to plant a vegetable garden. 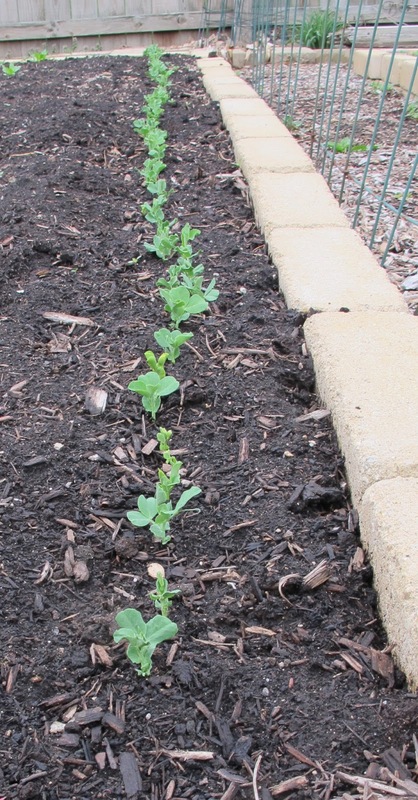 I will admit that some gardeners deviate from this rule of thumb at times, but for ease of planting, staking, covering, and harvesting, most gardeners will agree that it is always correct to plant in a straight row in a vegetable garden. However, in other areas of the garden, the answer to when is it acceptable to plant in a straight line is "it depends on the design". However, most gardeners will agree that bedding out plants in straight lines is something that should be left to the Victorian era. Today's modern gardeners will find that their gardens will be more pleasing if straight lines, in general, are avoided. But it is not always clear cut. 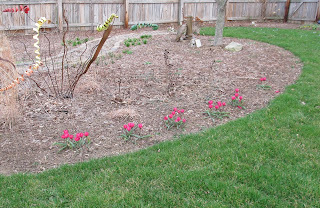 Here for example are some tulips that were planted to follow a curve. Technically, a curve is not a straight line. 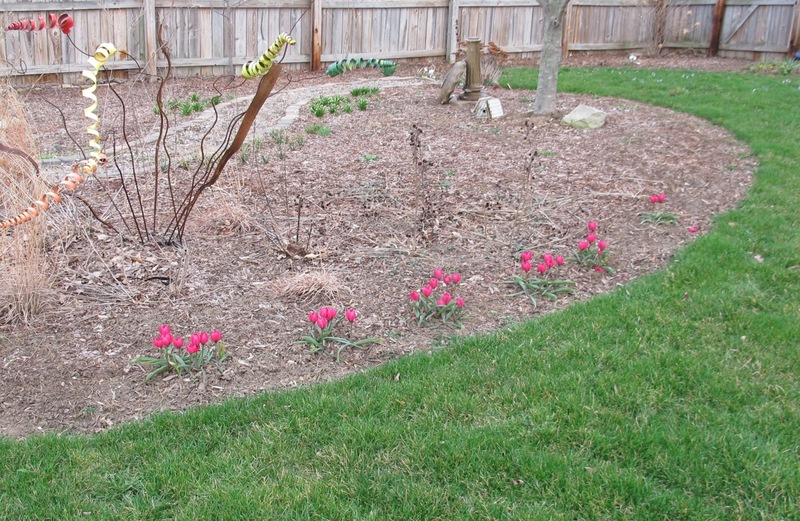 Plus, technically, these are groups of tulips planted to follow the curve. However, I think most gardeners would say that the gardener who planted these tulips probably also grows vegetables, hence her tendency to plant in straight lines or nearly straight lines. I further suggest that this gardener should look within herself to figure out why, in spite of having a curved edge to this border, and other plants in the border that were not planted in straight lines, she persists in planting in straight lines, or nearly straight lines. As noted, I suspect she also grows vegetables. I suspect she needs help. I admit that sometimes I plant in straight lines. I like to edge my paths with annuals and if the path is straight, then the annuals will be straight. I've always thought this looked nice! My tendency to want to plant things in a straight line frequently bites me in the hiney. Inevitably plants die leaving me with unsightly gaps. I am a longtime vegetable gardener, so at least now I understand the problem. I tend to plant willy-nilly - there's an empty space, stick something in it! Today I've been building a bamboo trellis for my pole beans. It needs to be straight and secure or it might fall down. 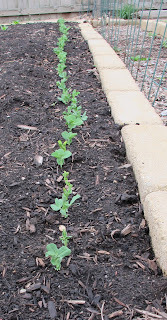 But the beans will probably be planted in a ragged row not exactly straight. Basically, I say, plant whatever way makes you happy. It seems that the issue is wanting to edge beds with an outline. Is that wrong? The edges seem to cry out for such treatment, the containment against paths, lawn, the ever present *other*. I still do it. For me it is never. Straight lines don't have to be boring. Lots of stunning gardens are planted that way, reinforcing the design of the house or the structure of the garden. Mostly these gardens are in Europe, where a more formal approach seems to be more accepted. But even straight lines can result in amazingly informal feelings. For instance, at le jardin plume in Normandy, France, ornamental grasses are arranged in squares among old, twisted apple trees. The result is outstanding! I confess have planted in lots of straight lines, in the vegetable garden - and elsewhere. I keep trying to break this habit and i do have curves, but I also 'line' the curves. I wish Hortense were closer so I could get some ongoing therapy. I never manage to plant in straight lines - even in my vegetable garden! I think maybe your adviser and i are college mates! Haha, I can't plant in straight lines even if there is a meter stick. I love your posts. I like your blog, visit my blog about building or buying a greenhouse that is affordable and sturdy. That works. You want a greenhouse that absorbs as much solar energy (sunlight) as possible. In the greenhouse the solar energy is converted into thermal energy or heat. So you want a greenhouse that will hold that heat longer. http://www.freewcn.com/ I will put your comment and link on my site to yours.